A few interesting articles and a podcast from around the internet. The article also does a great job of breaking down fund economics to explain why more patient investments in ecosystem are virtually impossible. Overall, it is a great look at the challenges faced by early stage entrepreneurs in India. This article is a nice look at how small investments in quality control and chain of custody management allow dairy companies and farmers to profit more from their efforts. This is a fascinating interview with Intellecap’s Aparajita Agarwal as she talks about social enterprise in India, the differences from working in Africa, and the constant battle entrepreneurs face when they’re trying to differentiate themselves. Most interesting for me was the point about entrepreneurs trying to make their idea feel truly unique. I suspect much of this need is driven by interactions with impact investors and the benefit narrative those investors are trying to build around their work. Unlike traditional investors who can look simply at the financials and management team in their due diligence, self-defined impact investors often need to have their imagination captured by the social benefits of the business. As such, entrepreneurs often try to tell a story about how their product or service is “revolutionary” or “innovative,” when the reality is that their business might be most socially beneficial and profitable if they could focus their efforts on the fundamentals. There is a saying that has been floating around Upaya for a long time that seems relevant here – sometimes a business is not innovative for what it is doing, but for where it is doing it. This interview shows we might not be alone in that thinking. Do You Want More Upaya? Well You're in Luck! 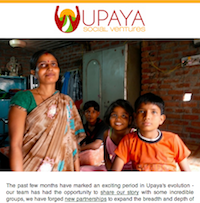 The re-launch of upayasv.org is more than just new layouts, photos and fonts. It also is an opportunity for us to bring a new voice into the global conversation about ultra poverty, employment, and entrepreneurship. The people who make up the Upaya team each bring a unique set of experiences and perspectives to the organization. I would say twice a week I wake up to an email with some article, video, or podcast that one of my colleagues is struck by, and it usually sparks a fascinating dialog among people looking at a single issue from a variety of different angles. Think of it as a cross between Squawk Box, Stanford Social Innovation Review, and Guy Kawasaki’s How to Change the World blog, with a dash of boringdevelopment.com thrown in for a bit of pragmatism and humor. We always thought that one fine day we would start sharing these conversations with the world, and that day has now come. So what can you expect from this blog? More than anything, it will be a candid look at the conversation around a new approach to extreme poverty alleviation. Sometimes the conversation will be more academic, other times it will be more casual, but it will always give you an opportunity to learn something new. We will write for entrepreneurs and investors, students and social innovators, philanthropists and philosophers alike, and welcome all readers to share their thoughts in the comments section. “What We’re Seeing” - a list of three interesting articles, multimedia pieces, and events that caught our attention, along with a few lines about what makes them interesting. “New Frontiers” - As an organization we’re committed to getting beyond the metros and into communities to learn about new opportunities, and we’re happy to bring readers along on that journey. A member of the Upaya team will profile an industry or geography where we feel there is potential for job creation and explain why. “Best Practices” - from our work with our current partners and conversations with peers, we’re constantly learning about the issues entrepreneurs face and new tools to help them be successful. “Counterpoint” - Real change requires challenging current assumptions, and as an organization Upaya is not afraid to do just that. If we read or hear something we disagree with in the fields of development, entrepreneurship, or philanthropy, we’ll talk about it. We’re not afraid to take an unpopular opinion, but are always considerate of differing opinions. One last promise - you have my word that this will not just be a megaphone for updates about Upaya. That what our News page is for. This blog is a place where we can stretch our legs, talk about critical issues, and hear from those who are interested in the same issues we are. So there you have it. We’ll try to post a few times a month to start, and more frequently as we continue to grow. Questions and comments are always welcome - just give us a shout.